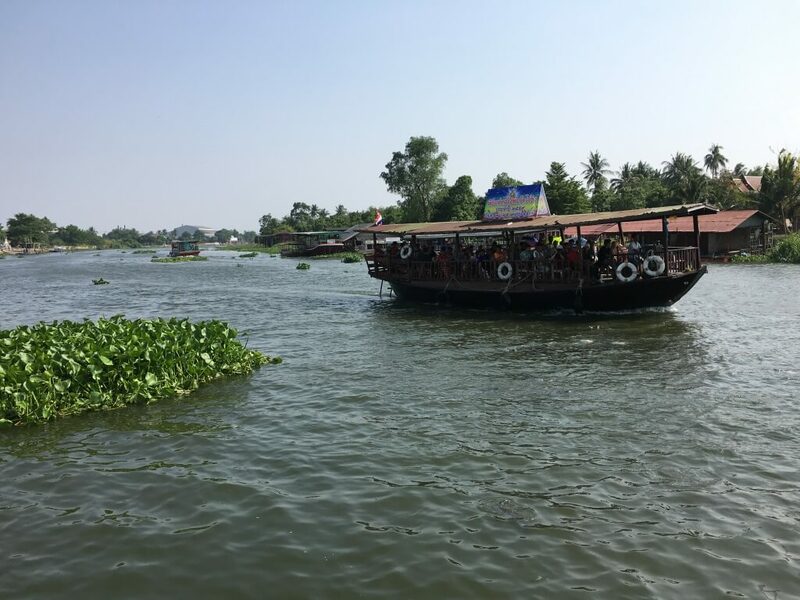 One of the great excursions to do over the weekend is to visit one of the many floating markets within easy reach of Bangkok. The one that I visited last Sunday is called Don Wai Market (ตลาดดอนหวาย) which is in Nakhon Pratom Province (นครปฐม). My mom took me here before a couple of times when I was little and I haven’t had a chance to revisit since, so it was nice to be back and find that the area here hasn’t changed much at all. 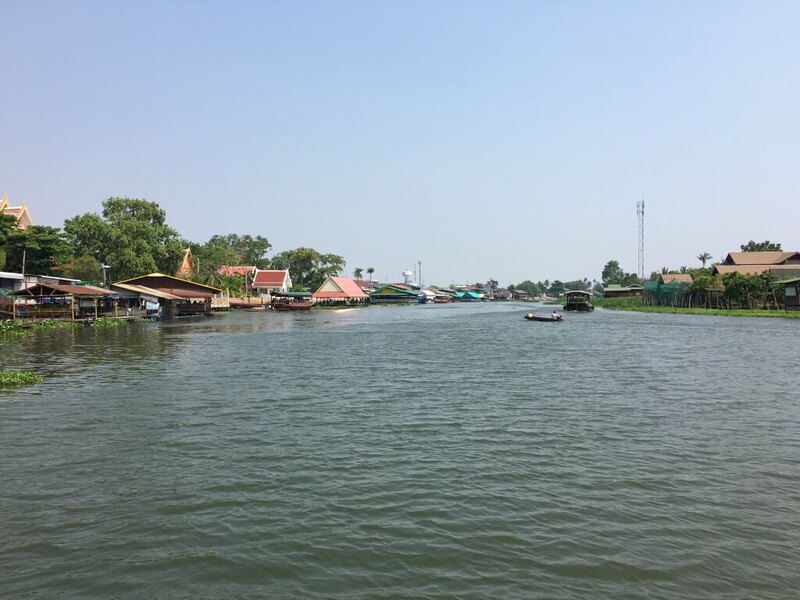 Some people call the market floating market (ตลาดน้ำ dtà-làat náam) but all stalls and sellers are actually on land and there are no boat vendors like what we imagine floating markets in Thailand should have. So the market can be called a riverside market rather than a floating market. It is located on the bank of Tha-Jeen river (แม่น้ำท่าจีน) which is also known as Nakhon Chai Si river (แม่น้ำนครไชยศรี). 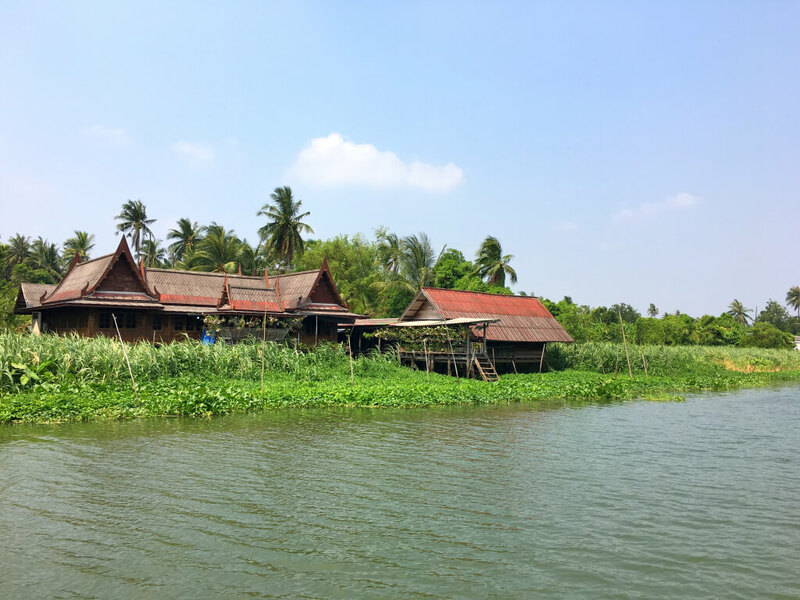 Along the river you can see many traditional Thai style houses. 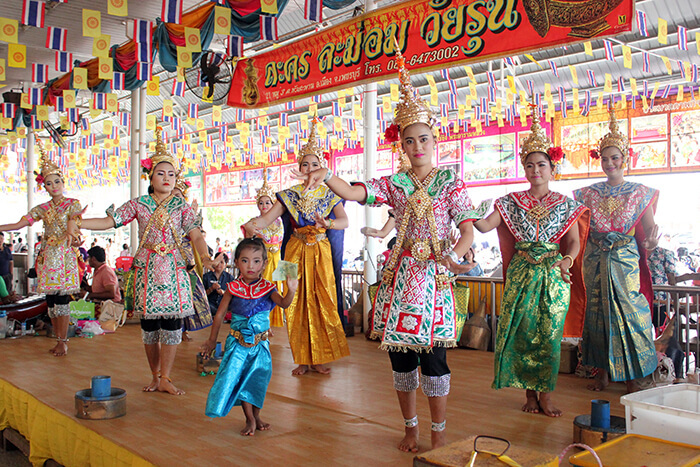 Don Wai market was established over a hundred years ago, but it became popular around 15 years ago among Thai visitors. I didn’t notice a single westerner while I was there which is nice if you would like to experience the authentic feel of a Thai market instead of a place that set up to attract tourists. 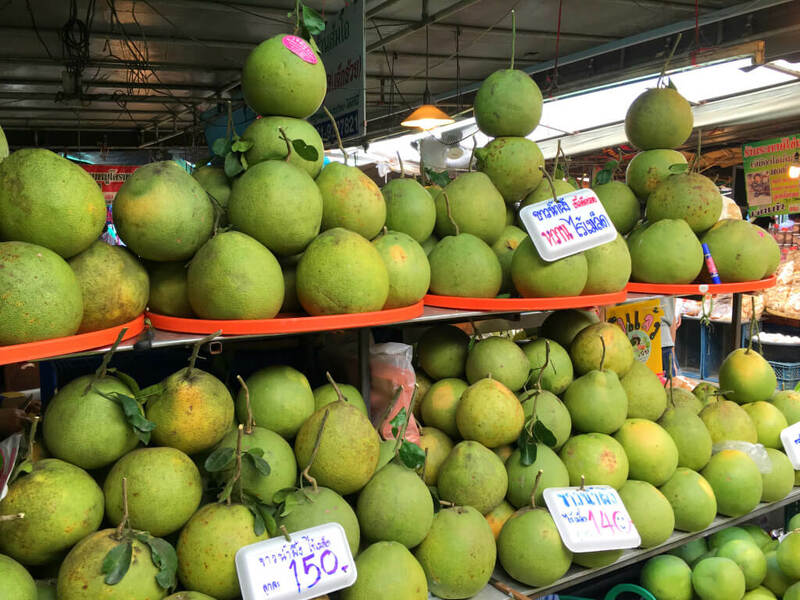 One of the most famous product of Nakohn Pathom is pomelo. They produce the best pomelo in Thailand. There are two breeds of pomelo that are well-known to Thai people: the Khao Namphueng breed (ขาวน้ำผึ้ง) and the Thong Di breed (ทองดี). 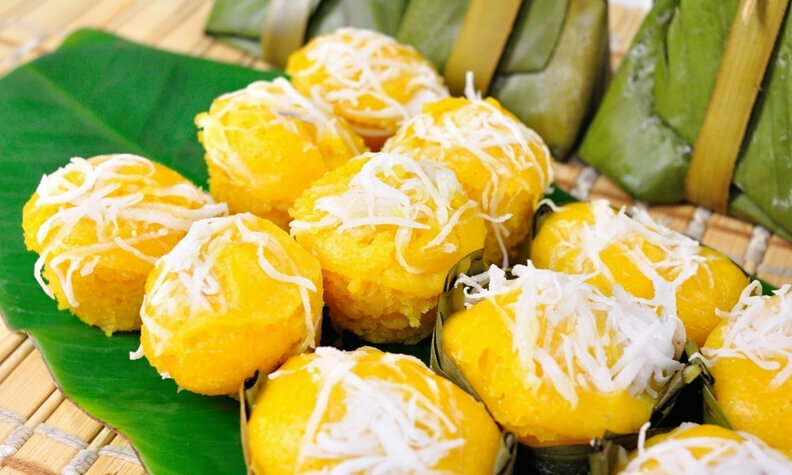 The most famous Khanom Tan in the market is a place called Khanom Tan Pa Khai. It costs only 25 Baht per pack. 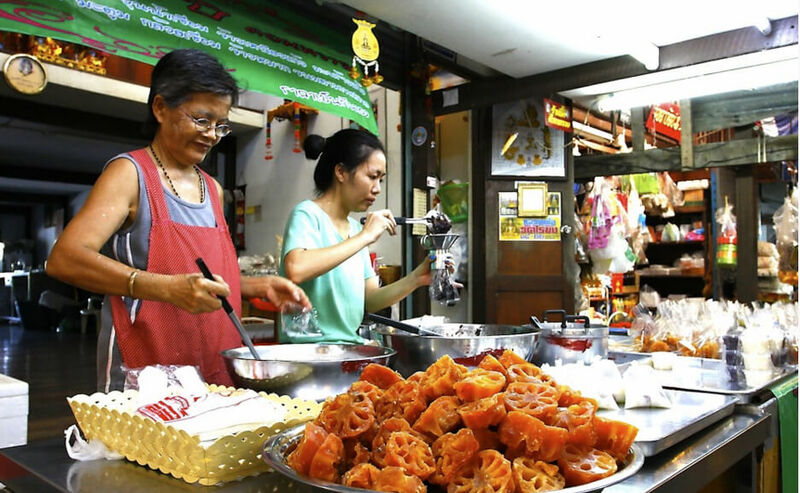 This market has no seats for visitor to sit down and eat food like in most floating markets around Thailand. 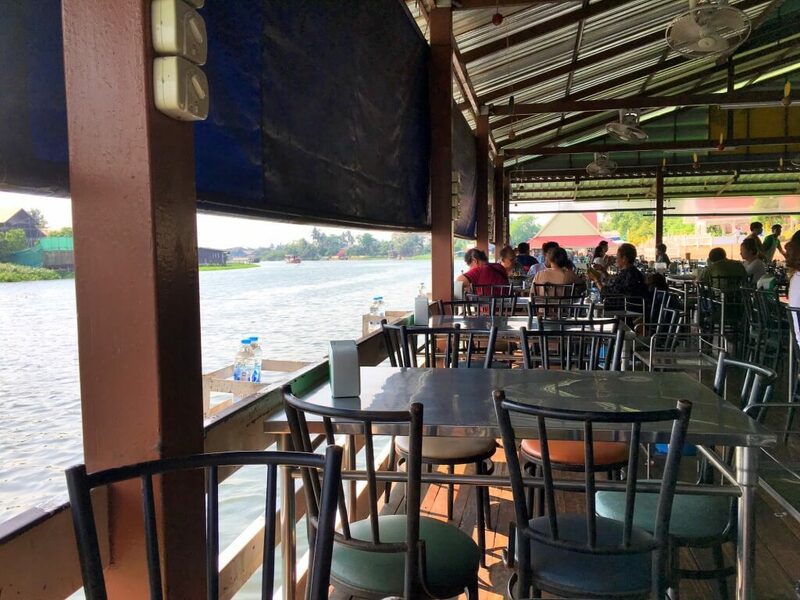 However there are many riverside restaurants in the markets where you can order fresh cooked Thai dishes and enjoy the view. My lunch at one of the riverside restaurants in the market, very fresh and tasty! If you would like to see more of the area here you can join one of the boat trips along the river. 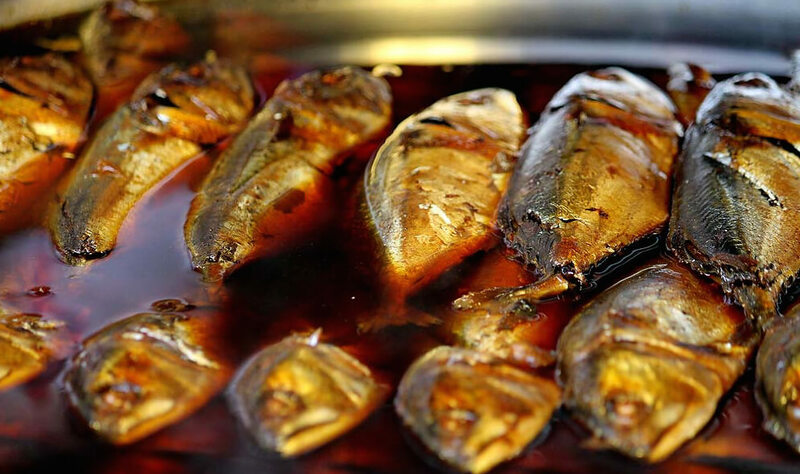 You can buy food in the market and then bring that on the boat trip with you. 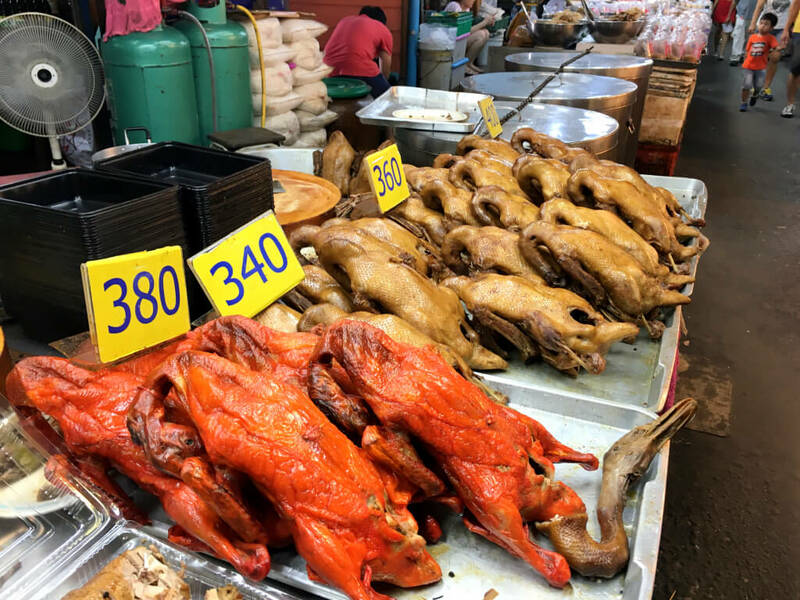 Don Wai market is in Sam Phran district in Nakhon Prathom province which is about 40 kilometres West of Sukhumvit in Bangkok. I just use the service of Grab Taxi application and the driver drove me there in less than an hour. Unfortunately there is no public transportation that can get you directly to the market. 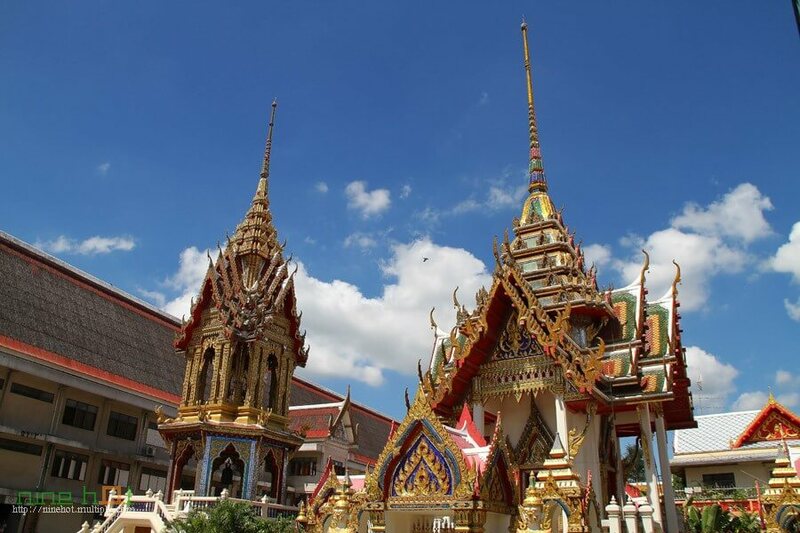 Your trip to this market is best to combine with a visit to the Wat Rai Khing temple (วัดไร่ขิง) turning your day into a cultural Thai experience. Opening Hours : Everyday from 6:00 – 18:00. It is usually quite crowded during weekends. If you would like to avoid the crowds, arrive on a weekday or early on a weekend. – Credit cards are not accepted so make sure to carry some Bahts on you. There is also ATM machine in the market. 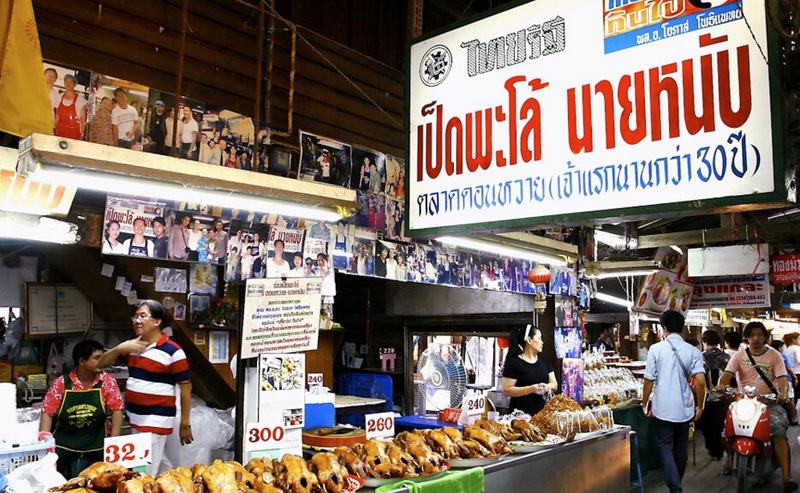 – The walk way in the market is quite narrow and when it is crowded it can get very hot for those who are not familiar to Thai heat. You might want to bring a manual hand fan with you. I love your website. 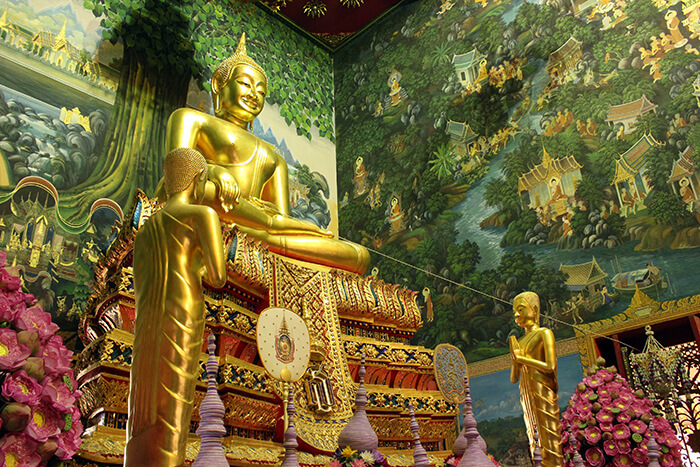 Thanks for sharing with us all the beauty of Thailand. I will be in Bangkok again this Nov 2018 and definitely will visit the Don Wai market. Do you have any ideas how much it cost to ride a taxi from Silom to Don Wai market so I can bargain with driver? Thank you very much for your help. How do I go and get back from Don Wai to Bangkok (Onnut)? The most convenient way would be by taxi. Have you used Grab Taxi application before? It is a vey good app. It looks rather similar to Ampawa floating market doesn’t it? This market is more authentic than Ampawa in my opinion. 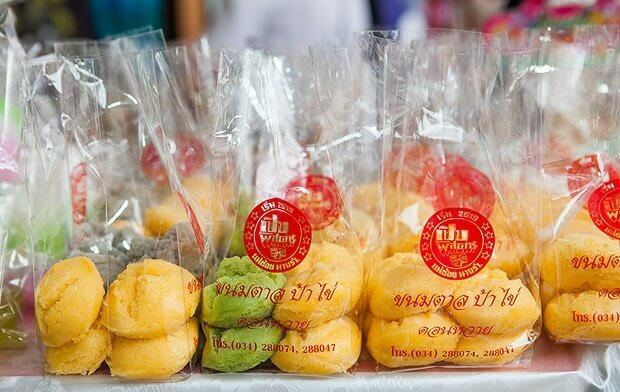 You can find local produces here while in Ampawa mainly offer tourist souvenirs. Thank you for you indepth sharing about the boat cruises. I am very much interested in it and would like to try one the next time I am there. I was just wondering, where is the ticketing counter/starting point for the river cruises? 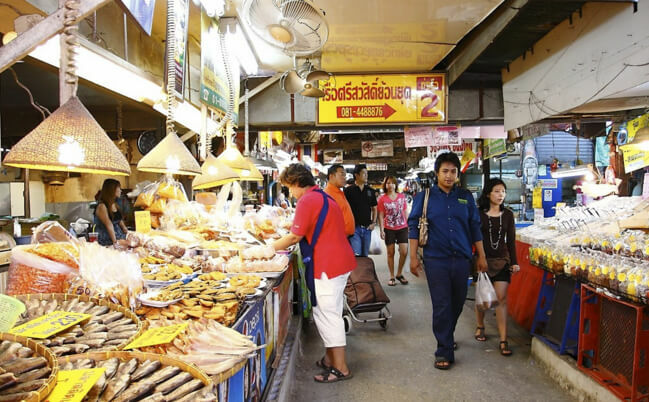 thank you for the informative and in depth article about this interesting Thai market. Can you advise, is this market worth to go or Ayutthaya or Safari. we have young kids/ teen and also adults. Sawatdee ka Angie, I am sorry for my late response. My computer was in repair shop for three months. I hope you had a good time in Bangkok. I told myself before I must read ALL the articles regarding Thailand attractions you have posted here. Tonight I am just one step closer to my goal. 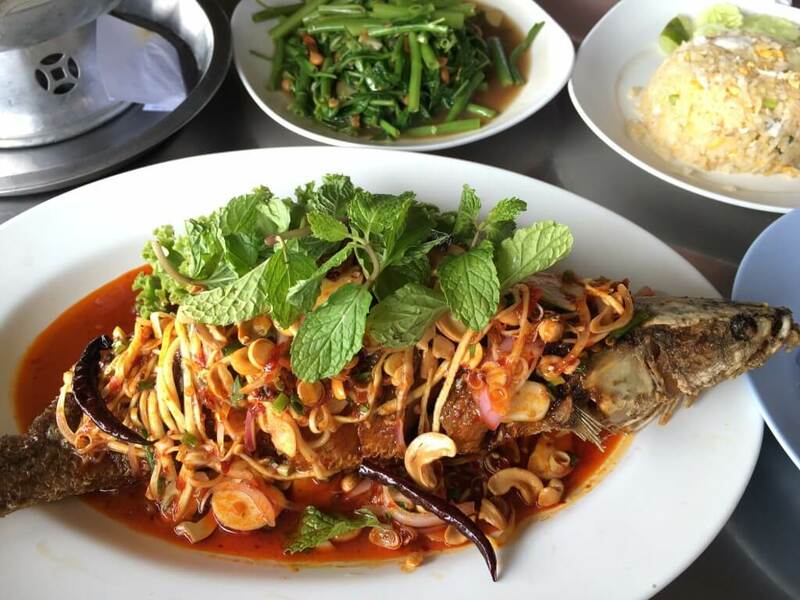 I really image one day I’ll visit this place, buy Khanom Tan and the Khao Nampheung Som O, and enjoy my lunch at the riverside restaurant. 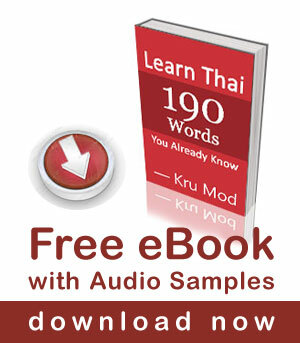 You are a Thailand ambassador to me! Hello Kruu Mod, thank you for the informative and in depth article about this interesting Thai market. I would also like to thank you for your series of YouTube videos. 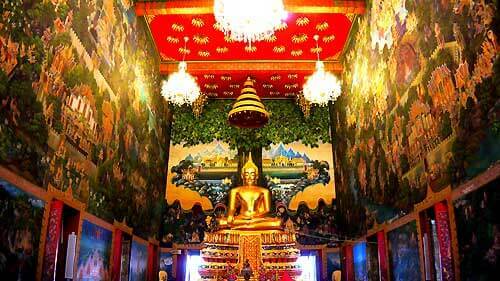 They have been very helpful in learning to speak the Thai language, and about Thai culture.